“A Corporate Time with Tom and Dan” will be Wednesday nights directly after the Philips Phile (What a frigg’n lead in, right?) from 7pm-8pm on Real Radio 104.1FM in Orlando, Florida. You can also catch the replay on Saturday mornings at 10am for those of you that aren’t too keen on prime-time weeknight programing. We’re not 100% sure on this but we would also imagine that there’s going to be a podcast of it floating around on the Real Radio 104.1 website as well. I thought you guys were done with terrestrial radio? So did we! This is the brain child of Program Director Jack Bradshaw. He was obviously familiar with the “A Mediocre Time with Tom and Dan” and the fact that we decided to make that our full time job the past 2 years. We see this as a pretty cool opportunity to bring a little “brand awareness” to all of fine folks who have no idea that we churn out weekly podcasts every Friday and Monday afternoons. 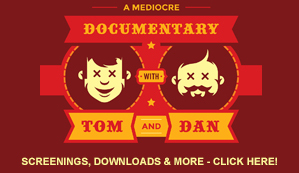 You have no idea of how many people have no clue about “A Mediocre Time with Tom and Dan” and the fact that many people are just finding out about TomandDan.com. Let’s be honest. 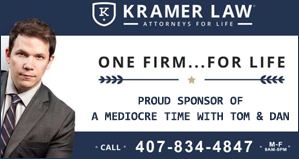 There’s a limited amount of mention as to what Tom and I have been doing other than assisting in the marketing department at Orlando City Soccer Club. (Which we still do and love!) It’s nice to full inform folks on what we’re doing now. How will this effect the Friday Free show? It won’t. Not in the least. The Friday Free Show will always be one of the Tom & Dan properties that we give the most amount of attention to because it was first. Think of it like the oldest and brightest child we’ve given birth to. Do you have any idea of the amount of trials and tribulations that we’ve been through in order to keep that show up and running? Half of it you wouldn’t even believe! Trust us. Nothing changes on that baby. How will this effect the 2 BDM shows that you guys release on Mondays or Tuesdays? That will not be effected at all either. BDM Members are the elite core of people that make it possible for us to ‘cast in the first place. Without you guys, there would be no other shows. That’s just a simple fact. Also, we’re going to make a consorted effort to make the BDM shows even better than before as well as the parties and premiums that go along with membership. Although I will say that we’re not off to a good start in the fact that we had a full studio meltdown today – losing the internet for the time needed to record and also losing an entire show that we had just recorded with Ross. Off to a great start! Bahahahaha. We threw a ton of names around but this seemed like the best to make sure that you guys knew that “A Mediocre Time” was first and forever in the back of our minds. It’s an FCC friendly show so the idea of throwing the term “corporate” in there seemed like a no brainer. We would love nothing more for the guys that have been with us for the Friday Free Shows to join us but they do have lives and we’re a very, very, very small company. We’ll see but let it be known that we would love that! Do you own the show or are you working for Clear Channel again? As a matter of fact, we DO own the show! This was one of the only things that would have been considered a deal breaker. Without getting into too much of the legal mumbo jumbo we lease the show to the station because it’s ours. Pretty cool, huh? Luckily we do the show from our same “A Mediocre Time with Tom and Dan” studio so it’s pretty damn convenient for us. After recording, we pass the show on to Jack and let him work his scheduling magic. Are you making money from the show? Can I advertise on the show? Sure! Email us at Show@ACorporateTime.com and we’ll pass it along to the correct people for you. Who did the branding for the new concept? Just like the artwork that we have for “A Mediocre Time with Tom and Dan”, we reached out to our branding agency Danger Brain. They did the original artwork for AMT as well as our parent company of T&D Media. They’re amazingly creative folks who have an wonderful knack for nailing down how the sound of a show “should look.” Google them if you’re in need of a fresh brand. You will not be disappointed. 1 hours isn’t very long is it? Nope. It’s not. But we look at it like this – one glass of fine wine is better than no glasses of fine wine. Haha.